Sunday, the last day of the 2013 International Mother Road Route 66 Festival in Springfield, turned out to be a relaxing day. By the last day of a festival, you've usually already caught up with friends, made most of your book sales, and eaten way too much festival food. We started the day with a great breakfast at Jungle Jim's Cafe on Peoria Road. This classic diner is decorated with speedway memorabilia. Four of us enjoyed good food, service, and conversation. From there it was back downtown to finish off the festival. The crowd was much smaller on Sunday and the event was in serious danger of imploding by the middle of the afternoon. The Illinois Travel Expo officially closed at 2:00 pm and we were soon packed and on our way. 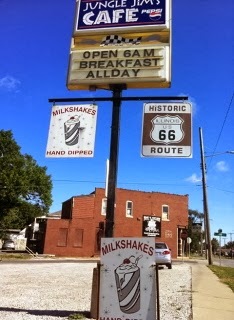 On the way home, another visit to Weezy's Route 66 Bar and Grill in Hamel was in order for a late lunch. Or was that early supper? 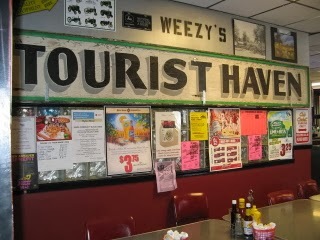 Original Tourist Haven sign inside Weezy's Route 66 Bar & Grill. Now it's only a year until the next International Mother Road Route 66 Festival in Springfield.